If you have a few minutes at the end of this tutorial, you can also follow a 20 minutes webinar here, where our Community Manager does a complete review of the site and shares some interesting tips that can help your enjoy Toluna to the fullest. The Toluna community offers our members a chance to create their own content and get feedback from our millions of members. Our content creation platform allows our members to create Polls, Topics, Thumb Its and Battles by clicking on the content type you would like to create. 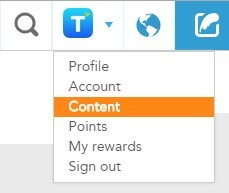 You can earn 100, 500 or 1000 points for each piece of content you create. Once you have mastered how to create content, click here to learn how you can earn points for your creations. What is the definition of each content type? A Poll is a single question with multiple options. Do you think global warming is a short term threat or a long term threat? A Topic is an open debate where users share their opinion to create an open discussion. Topics are generally made by asking a question in the subject line and then adding a few more words of explanation or follow up questions in the “your own opinion” section. Your question: Are social media sites bringing people closer together, or are they poor substitutes for real life relationships? Your opinion: I think social media sites bring people closer together if it’s also accompanied by social outings and real contact. What do you think? A Battle allows you to compare 2 items so the community can help you chose. Compare 2 images or videos and find out with one the community prefers. Create a Thumb it, if you want to know how the community feels about a specific item or subject, simply add an image or a video and see what they say. Don’t forget to add images and videos to your content to make them more appealing. To add an image or a video simply click the camera icon, or video camera icon and upload your own photos, or use our search tool. Click here for a complete tutorial on how to add images/videos. *Quick Tip* Content that include a photo or video tend to be more interesting to members than ones that do not include this feature. In fact, our Toluna Team members may even send you some bonus points. Where can I find the content I created? Once your topic, poll, thumb it or battle is launched, you can keep an eye on the results by going to your profile page, or by going to your “Content page” in the dropdown menu under your profile picture. Thanks for reading a bit about Toluna, and we look forward to bringing you more information in the future. You have more questions you would like to know the answers to? Feel free to leave them here. This entry was posted in toluna and tagged cash, content, earn rewards, opinion, points, polls, rewards, saudi arabia, toluna, topics. Bookmark the permalink.